Zogics has everything fit for fitness professionals. We are continuously adding new products across all categories to help you find the right items for every part of your facility. Explore the latest in fitness equipment, cleaning solutions, and bulk bath products. Learn about our newest products below and see how they can improve your facility. Foam Rollers are a great fitness accessory to enhance post-workout recovery. The all-new GRID VIBE vibrating foam roller takes recovery routines to the next level. You will be able to improve mobility, relax tight muscles, and increase range of motion. With TriggerPoint's GRID pattern, you can target more muscle tissue layers. The GRID VIBE will minimize pain, allowing for a longer rolling regimen. Recommended for use on calf, glutes, hips, lats, quads, and spine. 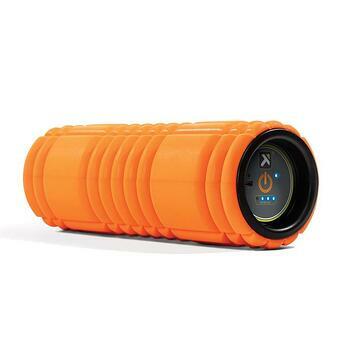 You can also use this compact foam roller on the go. It is travel-friendly and holds up to 2 hours of battery power. Are you looking for bulk shampoo and bath products to boost your gym members experience? Your facility guests will love our new line of Babor shampoo, conditioner, body wash, and lotion. Since 1956, Babor has been a pioneer in bath and body care products. All Babor products on Zogics.com feature a lime and green tea scent that is gentle for everyday use. Your guests will also enjoy bath and body products made with natural ingredients and purified waters for a fresh, natural clean. Buying bulk shampoo and body care products for your gym or fitness facility will not only keep your members clean but will also save you money. 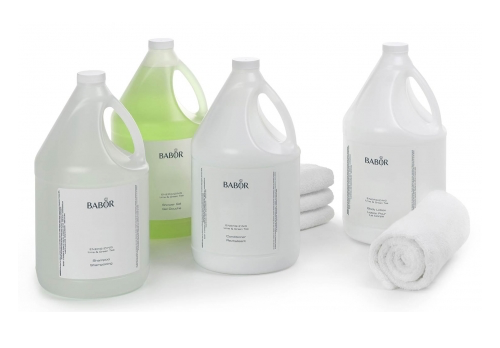 Babor products are available in both gallon and case options. The WOW! line of green cleaner will keep your stainless steel looking as good as new. It will provide your facility with a streak-less and smudge-less cleaning solution. All that's left behind is a dry protective barrier to protect against rust and other build-up. WOW! Towelettes are the perfect choice when needing a direct-controlled application on any stainless steel surface, including doors, elevators, kitchens, and restrooms. WOW! Spray is 100% usable product great for stainless steel countertops, fixtures, and mirrors. WOW! Miracle Cleaning Paste is an excellent option for tough to clean areas, such as ceilings and over-vertical walls. It also cleans and polishes in one step. Easy to apply, it will clean multiple surfaces, including many hard, no porous surfaces. Keep your members fresh and clean with the best commercial mouthwash solution. It is a perfect amenity for your gym or fitness facility. Members will be sure to love the soft mint taste, which is a fresh but not overpowering clean flavor. 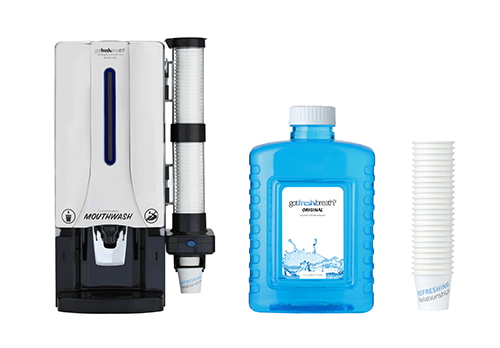 The Mouthwash Dispenser can be wall-mounted or self-standing. It is also tamper-proof, ensuring that the mouthwash and cups are safe and sanitary. The Mouthwash Refill Case keeps your unit stocked with 1.5-liter bottles, which are good for 100-120 uses. Each case includes six bottles and a box of cups.